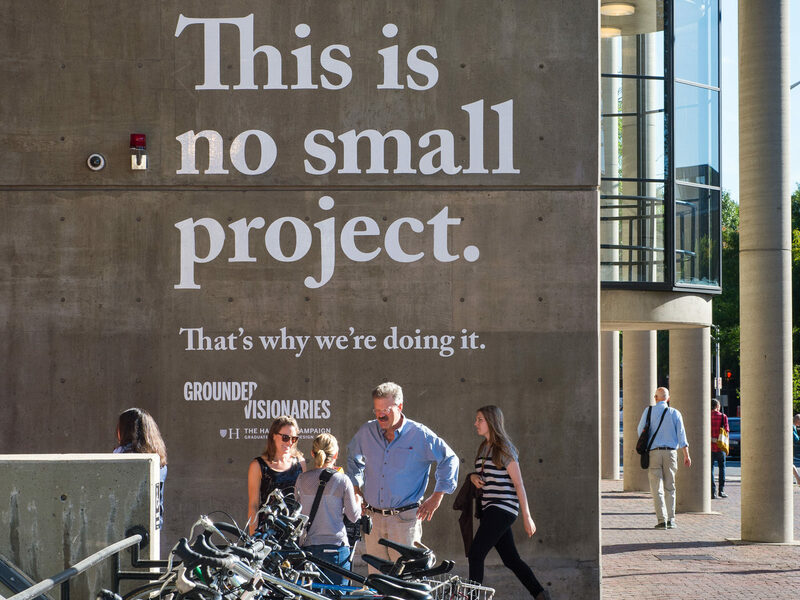 Emblazoned on the side of Gund Hall, this phrase offered motivation for the Graduate School of Design’s $110-million campaign launch. 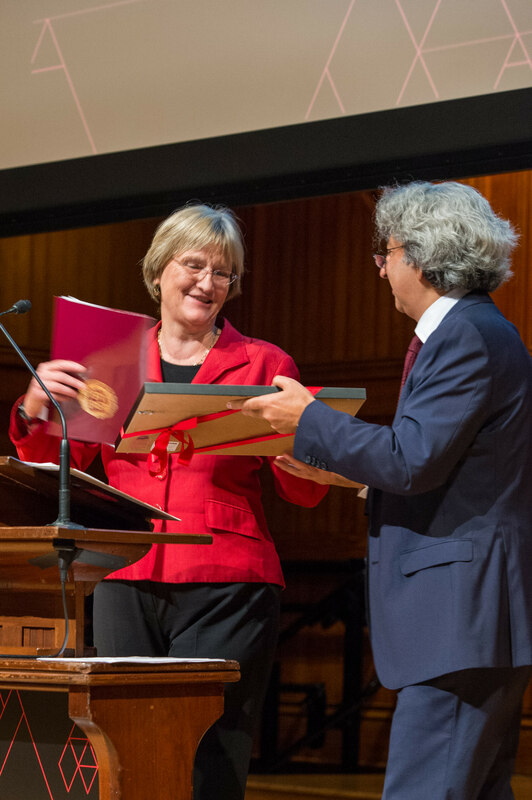 GSD dean Mohsen Mostafavi awards President Drew Faust an honorary certificate naming her a “grounded visionary” during Friday’s opening event in Sanders Theatre. Pritzker laureate Fumihiko Maki, M.Arch. ’54, closes the weekend’s events with a Saturday evening speech in Piper Auditorium. Dean Mostafavi speaks at Saturday evening’s program in Piper Auditorium. 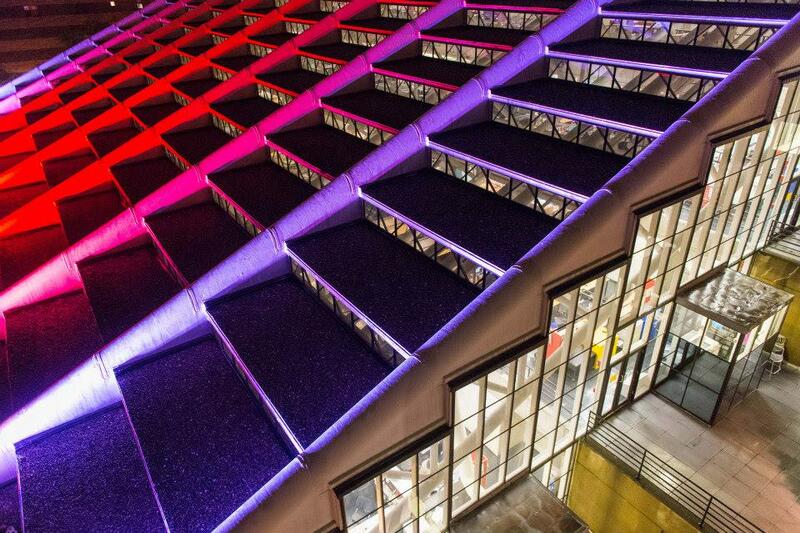 Gund Hall, the heart of the GSD campus, lighted up to celebrate the weekend’s launch events. The Harvard Graduate School of Design (GSD) launched its $110-million-plus fundraising campaign on September 12 and 13 with a series of events highlighting the school’s “grounded visionaries”: architects, planners, and designers who are at once free to dream of inventive solutions for—and intensely concerned with the practical challenges of—building a better world. Part of the University’s $6.5-billion capital campaign, the GSD campaign will support expanded international research and studio programs; new spaces for research and teaching, including proposals for a new research building to augment Gund Hall; and financial aid for students. Campaign co-chair John K.F. Irving ’83, M.B.A. ’89, whose $10-million gift kicked off the campaign last year, announced on Saturday that the school has already raised $69.23 million, or 63 percent of its total goal. Speeches by two of the school’s most distinguished affiliates—both recipients of the field’s top honor, the Pritzker Prize—bookended the weekend. On Friday night, Dutch architect Rem Koolhaas, professor in practice of architecture and urban design, set the tone for the events to follow with a speech in Sanders Theatre. Speaking of the challenges and opportunities that rapid urbanization and even more rapid technological advancement pose for designers, he showcased the exhibit, a reexamination of the fundamental elements of architecture and design, that he designed for this year’s Venice Biennale with the help of GSD students. The following evening in Piper Auditorium in Gund Hall, Fumihiko Maki, M.Arch. ’54, G ’56 provided retrospective reflections on his six-decade-long architectural career, offering reminiscences on his work with many of the school’s earliest leaders in the 1950s. art and culture [UPDATED 9/15 at 2:30 P.M.]. Panels and lectures on Saturday highlighted how the school approaches these issues through research, teaching, and what Mostafavi calls the unique system of “research through pedagogy.” In the architecture, landscape architecture, and urban planning and design programs, much of the core teaching occurs through a studio-based model, in which groups of 12 students learn the principles of design by engaging with the kinds of project-level problems they’ll encounter as professionals in the field. The five areas of impact, represented by multiple faculty and student speakers during several event panels, highlight the connections between the GSD and other Harvard schools, as well as between the school and the problems of the real world. The environment: As coastal cities face more storm events and rising sea levels, and as building materials and maintenance demand ever more of the world’s resources, sustainability has become increasingly central to the school’s research and teaching agenda. Last year, as part of the campaign’s initial phase, a major gift from the Chinese development company Evergrande Group funded the newly created, interdisciplinary Harvard Center for Green Building and Cities. 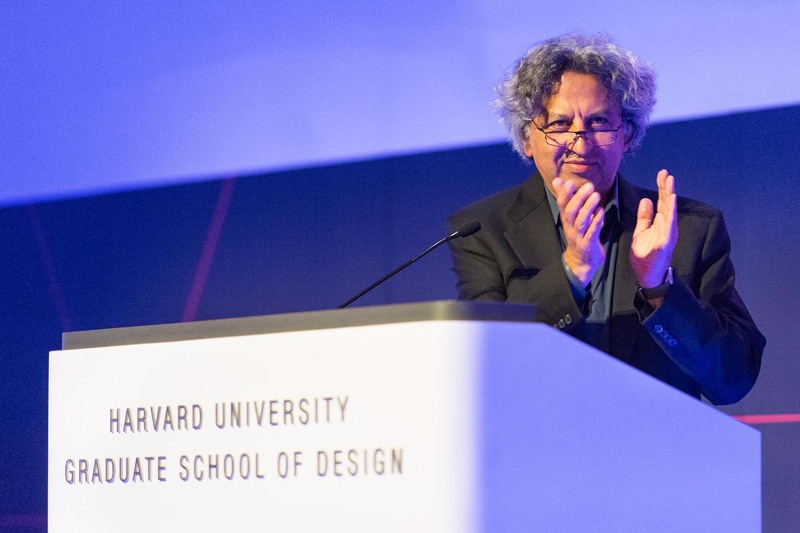 Ali Malkawi, professor of architectural technology and the founding director of the center, shared some of its initial work in an afternoon panel highlighting faculty research. As its first project, the center is turning its own office into a “living lab,” transforming the wood-framed house on Sumner Road, one of almost 14 million pre-1940s homes like it in the country, into a “net-zero” building that will require no non-renewable energy supply. Urbanization: The opening panel Saturday morning offered an intense introduction to the range of research on cities and the problems of global urbanization. Titled “Wildly Civilized: Ecological + Extreme + Planetary Urbanism…What’s Next?” the event asked six affiliates from across the school’s disciplines to weigh in on the future challenges of shaping the process of urbanization in focused, five-minute presentations. On one end of the spectrum, Martha Welborne, the chief planning officer for Los Angeles County Metropolitan Transit Authority and a former GSD Loeb Fellow, used the example of L.A.’s subway expansion to highlight the need for those in charge of building the future to understand the role that politics play in determining what can, realistically, be done. At the other end of the spectrum, professor of urban theory Neil Brenner, the head of the school’s Urban Theory “D-Lab,” questioned the very definition of “urban,” pointing out that United Nations statistics on the global population’s crossing the threshold to 50 percent urban are often based on shaky data. Brenner said these statistics often distract from the real challenges of population change, and shared with the audience why his research requires turning the problem on its head, understanding cities as systems in relation to both their own hinterlands and the planet as a whole. Engineering: As technology has created new possibilities for computer-based designs, researchers have begun to rethink the boundaries of what design has accomplished. Designers are interested not only in what they can do with materials but also in how they can invent new materials and machines to create them. In an afternoon panel on professors’ current research, Andrew Witt, MDesS ’92, M.Arch. ’07, an assistant professor in practice of architecture, described the work of the school’s design geometry lab, which is creating custom machines to elaborate new architectural forms made possible by these new materials. The school is currently exploring the possibility of a joint master’s degree in design engineering with the School of Engineering and Applied Sciences. The arts and humanities: As it pursues work in each of these areas, the school seeks to retain its traditional focus on the fundamental aesthetics of design and making the world a more beautiful place. In an afternoon session, McCue professor in architecture Preston Scott Cohen, M.Arch. ’85, Pritzker laureate Thom Mayne, M.Arch. ’78, and Kajima professor in practice of architecture Mack Scogin debated the tension between “revelation” and “relevance” in design. “I absolutely know [architecture’s] about personal obsessions,” Cohen said, arguing for the power of vision and point of view, even in the face of the constraints of architectural practice. The school has strengthened its ties to the arts and humanities in the last few years, especially with the Faculty of Arts and Sciences (FAS), by launching an undergraduate track in architecture studies within the department of the history of art and architecture. Noyes professor of architectural theory K. Michael Hays, who helped launch the program on the GSD side as associate dean for academic affairs, said in an interview that the collaboration has led to more robust connections among professors working on similar issues in the two faculties. With more funding, Hays said, the program could expand beyond architecture and into other areas of design culture, helping bring entire new areas of knowledge and “cultural production” into the College. To support expanded research and pedagogy in these five areas of impact and beyond, the GSD has delineated three different pools for its fundraising: enhancing global impact; expanding capacity, both physically and intellectually; and empowering students, to reduce graduates’ debt levels so they can pursue careers outside corporate architecture and design. 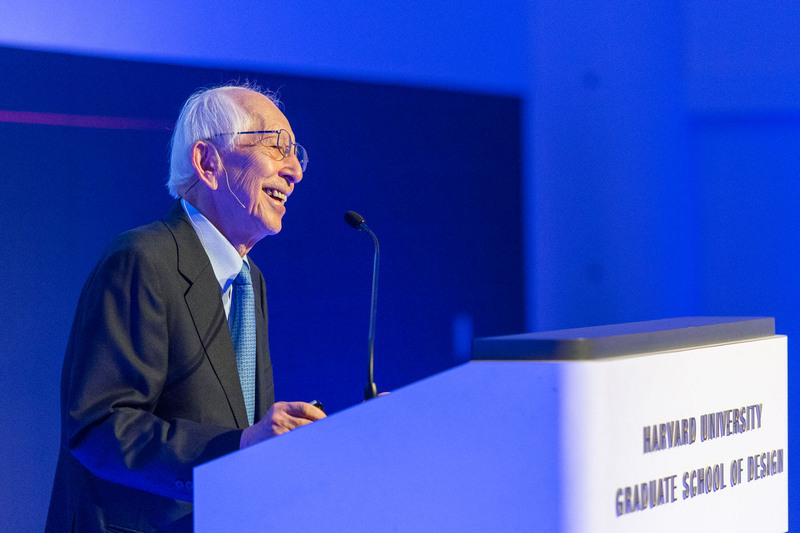 Global GSD: As Saturday evening’s speech by Pritzker-winning alumnus Fumihiko Maki made clear, the GSD has been an international school since nearly its inception in 1936, with early leadership from Bauhaus founder Walter Gropius, who chaired the department of architecture in the late 1930s, and Josep Lluís Sert, the Spanish architect who served as dean in the 1950s and 1960s. That global tradition has continued: as of the 2012-2013 school year, 45 percent of the 77 faculty members were born outside of the U.S., and the student population was 38 percent international. Capacity at home: The campaign’s second major goal, expanding physical and intellectual capacity, is a broad category that includes both support for a recently expanded professorate and student body and renovated spaces to house them. The school has grown since Mostafavi became dean in early 2008. The master in landscape architecture program, in particular, has doubled its cohort to 70 students in response to increased industry demand, department chair Waldheim explained. The campaign also earmarks support for the newly launched architectural-studies track for undergraduates, which began two years ago with funding from FAS and the GSD and from a grant from the Harvard Initiative on Learning and Teaching that provided the money to create a new, high-tech teaching space in Gund Hall. But in an interview last month, Mostafavi said that more sustainable funding is needed to continue the program and expand it into a stand-alone concentration. Supporting this growing group of students and researchers will require new spaces, and new kinds of spaces, as well. Gund Hall was built in the 1970s for a population of 300 students, but the school is now nearly three times that size. Gund’s five iconic “trays” take much of the building’s main space, creating an open and collaborative space filled with student desks, but today the trays are more crowded, and the rest of the building’s users are feeling the squeeze as well. “We’re just bursting at the seams,” Hays reflected. The campaign will look for funds to renovate Gund Hall itself, updating the physical structure to meet contemporary efficiency standards and retrofitting key areas to make room for modern research and classroom space. Irving announced on Saturday that renovations would focus especially on the school’s first floor and basement, including changes to the Loeb Library, which takes up a huge proportion of the programmable space outside of the trays. Supporting future visionaries: The final campaign goal is expanding student resources, including enhancing experiences while they’re in school and providing more robust aid packages to reduce debt once they leave. The average debt for U.S.-based students graduating from the M.Arch.I program, the school’s main training program for architects, in the 2013 fiscal year was $93,000, while their average expected starting salary was just $55,000, according to the school’s annual report. Campaign co-chair Phil Harrison ’86, M.Arch. ’93, president of the Boston-based international design firm Perkins+Will, said in Saturday evening’s presentation that the school has tripled financial aid as its student population has grown 40 percent during the last six years. According to the annual report, 91 percent of students received some financial aid from either the GSD (80 percent) or other Harvard funding sources in fiscal 2013, including (a rarity for architecture schools) aid to international students. The average overall grant to students for that year was $17,200.